In reality any item or substance that is discarded after general use or is deemed worthless can be classified as waste and considering the rate at which items and substances are disposed this results in millions of tons of waste being generated on an annual basis. This large and rapid accumulation of waste has created the need for immediate and effective methods of handling waste on a daily basis.The practice and execution of these methods is more commonly referred to as waste management which essentially is done to encourage a clean, healthy and safe environment overall. Even though waste management is heavily regulated by governments in order to avoid pollution and other health issues every individual must still play an active role by exercising proper waste disposal practices so as to ensure the effective management of waste. One way that each individual can play their role is by properly categorizing waste before disposal and since waste can be broken down into several different groups it is important to know what kind of waste it is so that it could be discarded in the appropriate manner. 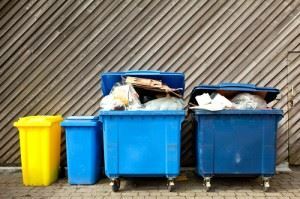 Brown Waste – This refers to any biodegradable materials that are primarily carbon based. Brown waste can include items such as grass cuttings, sawdust, hay, dry leaves and twigs, paper, cardboard, hedge trimmings etc. These materials should not be disposed in regular trash and most of the time is reused for a different purpose like mulching, composting or fertilizing gardens. Nevertheless if there is no use for these waste materials a waste removal company is usually paid to come in and remove it. Green Waste – Also another term for agricultural waste green waste is comprised of biodegradable materials such as grass or flower cuttings, hedge trimmings as well as domestic and commercial food waste. Mainly referred to as green because of its high nitrogen content green waste is typically collected in municipal curbside collection schemes or through private waste management contractors. Bulky Waste – Any type of waste that is considered to be too large to be removed by regular waste collection is regarded as bulky waste. In many countries worldwide bulky waste is often removed from streets and pavements and depending on the country or area a fee may or may not be involved. Most bulk waste items include unwanted furniture, large appliances and discarded lighting and plumbing fixtures. Large branches and logs are also regarded as bulky waste even though they are collected separately. In effort to ensure safe and proficient waste management throughout the country people everywhere are urged to play their role by responsibly disposing of garbage and other waste products in the appropriate manner. Waste management is something that every individual, household and business owner globally should be involved in so as to promote and maintain a clean, healthy and safe environment overall. Contact Junk King Marin for more information on how you can properly dispose of your trash. This entry was posted in junk removal marin, residential junk hauling, rubbish removal marin and tagged furniture removal marin, junk hauling, junk removal on July 12, 2017 by Julian Torres, "JT". Last updated August 1, 2017 .